Westwind Brigitte 138, a granddaughter of Tehama Blackcap L112, the foundation female of our Westwind Brigitte cow family. Her mother, Westwind Brigitte 008 was one of the most prolific donors in our ET program averaging almost 16 transferable embryos/flush. Westwind Brigitte 008 produced the Champion Calving Ease Bull at the Snyder Livestock bull test in Nevada with her 1st natural bull calf. Our Brigitte females descend from the most productive and prolific cow family in the Tehama Angus herd. DNA and progeny data of her progeny has proven that these females excel in both feed efficiency and carcass traits. 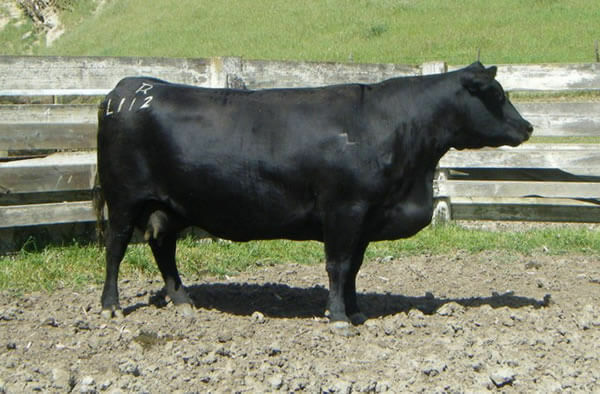 This cow family also has the rare ability to transmit exceptional fleshing ability and negative fat thickness to their offspring. Owned with Double G Angus.